This useful, precision tool cuts model-building stripwood and plastic material to length quickly and cleanly. It provides feather-free, accurate cuts using easily obtainable and economical single-edge razor blades. The rigid handle design ensures consistently square straight cuts and accurately angled mitre cuts. 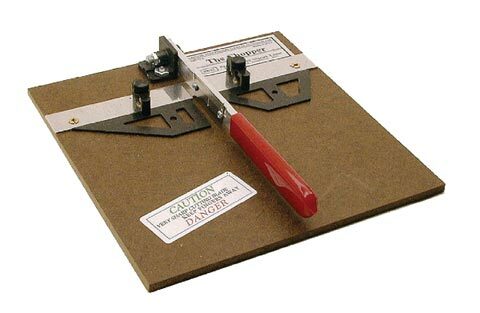 The 7.5" x 7.5" Masonite base has a 5.25" x 5.25" work area with 30, 45, and 60 degree mitre cut guides. An adjustable stop permits the exact duplication of pieces up to 3.25" in length. It comes completely assembled and ready to use, including an installed razor blade. Great for car decking, ties, trestle-building, and miniatures parts.